2017 Nissan Qashqai: From Britain, With Love. — Roving. Nissan first introduced the Qashqai in Europe in 2007, correctly predicting the explosion in the compact crossover segment. Fast-forward ten years and one full redesign, and the Qashqai is still one of the best selling crossovers in Europe. This Qashqai, which was new in Europe for 2013, was designed and engineered in Britain with an eye on the European market. It’s built at Nissan’s plant in Sunderland, UK. Here in North America, Nissan has had huge success with the Rogue, which is essentially a larger, three-row version of the Qashqai. In fact, the Qashqai is sold as the Rogue Sport in the U.S. The name Qashqai refers to a group of people living in the mountains of southwest Iran and literally translates to “a horse with a white forehead.” It’s sad but safe to say Americans would embrace this Iranian tongue twister about as readily as they would Mahmoud Ahmedinejad. Every year more buyers are leaving sedans behind for the practical packaging of crossovers, and every year there’s a raft of new options to choose from. With Rogues selling like poutine at a Leafs game, Nissan sees room for expansion into the growing subcompact segment. Things have heated up in the segment over the last couple of years, with contenders like the new Jeep Compass, Mazda CX3, and Subaru Crosstrek hitting the road. 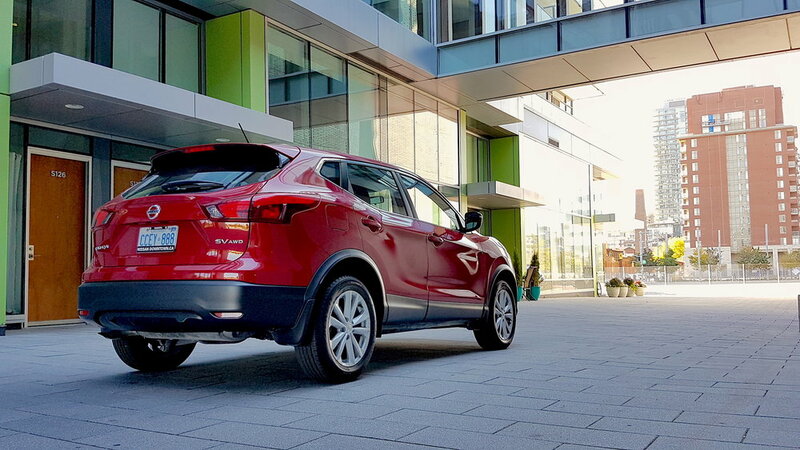 The Qashqai’s styling is clean and friendly, and the proportions are more pleasing than the larger Rogue. It looks good from every angle, with strong shoulders and a purposeful stance.It is particularly handsome with the top-spec SL’s 19-inch machined-face alloy wheels. My Qashqai SV tester came with 17” rollers, trading a few style points for a smoother ride. Inside, the Qashqai punches well above its weight with nice materials, a baby grand’s worth of piano black trim, and a nice heated, leather-wrapped, flat-bottom multifunction steering wheel. The SV has which are firm and supportive. The best looking iteration is the SL in light grey leather, with an expensive looking composition of light and dark dash materials. The Qashqai's interior measures a competitive 94.3 cu ft, with 20 cu ft of cargo space behind the rear seats expanding to 53 cu ft with the split rear seat folded. Press the start button, and the 2.0-litre 16-valve inline four wakes up, ready to set its 141 horsepower to work. 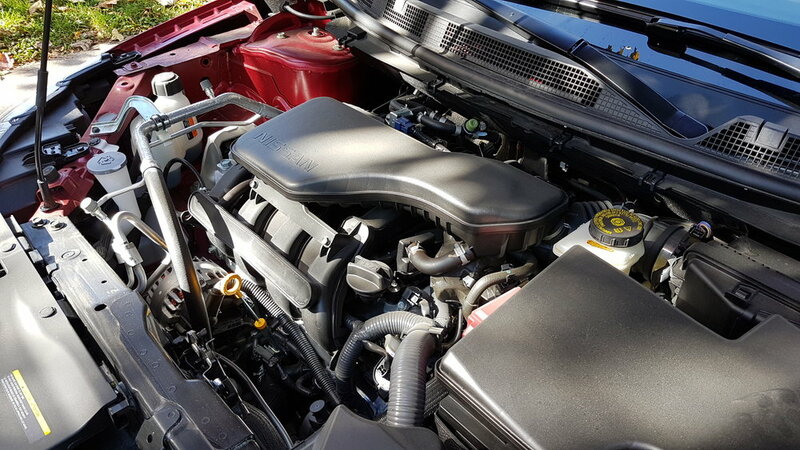 With peak power available at 6,000RPM, you need to wind the engine up a bit to get things moving, but it feels plenty perky around town. 0-100 km/h takes about ten seconds. I am admittedly not a huge fan of continuously variable transmissions, but this one is smooth and gets the job done with little fanfare. Manual shift mode comes standard on CVT models, so you can summon a simulated gear change yourself if needed. Nissan will sell you a base S model with a 6-speed manual transmission, but if you want any niceties like a sunroof, remote start, or satellite radio, you’ll have to level-up to the SV and its standard CVT. Nissan estimates your Qashqai will use 7.5 litres of fuel per 100km on the highway, and 9.1l/100km around town; respectable numbers for an all wheel drive crossover. The Qashqai’s tidy proportions make it easy to maneuver in city traffic, and parallel parking is a cinch with the standard rear view camera. SL models have an around-view camera system, which uses cameras in the mirrors, and at the front and rear ends to stitch together an overhead view of the car and its surroundings. Steering is quick and responsive, if not very communicative, and well suited to a small crossover. Nissan positions the Qashqai as a “pre- and post-family” vehicle, and the available trim levels reflect that. The base front-drive S model starts at just $19,998 and features standard heated seats, bluetooth, and 16” steel wheels with plastic covers. Hand over another $4,200 for an all-wheel-drive S. The mid-level SV, which adds 17” alloys, remote start, power moonroof, a six-speaker stereo, and a heated leather steering wheel, starts at $24,498 for front-wheel drive, with all-wheel-drive available for $2,200. The range-topping SL comes in at $29,498 with standard all-wheel-drive, 7-inch touchscreen with navigation, leather seating surfaces, and around view monitor. The SL trim also unlocks the availability of the $2,700 Platinum package, which adds Automatic Emergency Braking, Rear Cross Traffic Alert, LED headlights, Nissan Connect telematics services, Blind Spot Warning, Intelligent Cruise Control, Lane Departure Warning, and Intelligent Lane Departure Prevention. The SV model will likely be the strongest seller, as it strikes a good balance between equipment and price. But is it the one to buy? Cars are advancing quickly these days, with high tech new features (like those in the SL+Platinum package) making their way from premium brands down to mass market vehicles like this Qashqai. If you're planning to keep your car for more than a couple of years, you'd be wise to buy one today that has all of the connectivity and driver assistance features you can get. At resale time, models so equipped will have much stronger resale value than lesser equipped models. Plus, once you've driven with adaptive cruise and lane departure alert, you won't want to go back. Whether it's this Qashqai or another car, you won't regret the upgrade. Special thanks to Nissan Downtown for providing this test car.